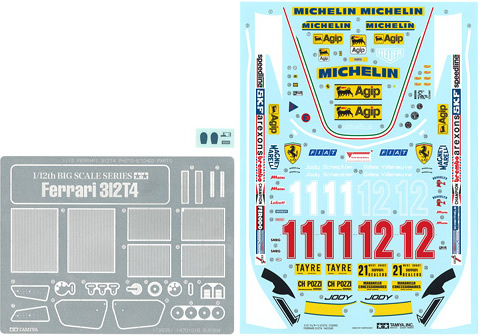 << Back TAMIYA "Ferrari 312T4 w/Photo-Etched Parts"
TAMIYA "Ferrari 312T4 w/Photo-Etched Parts"
*High-quality 1/12 scale assembly display model. *Front and rear suspensions feature movable coil springs and stabilizers. *Meticulously detailed flat-12 engine complete with wiring and metal air funnel mesh parts. *Body cowlings can be removed after assembly to showcase interior details. *Synthetic rubber tires provide an authentic race feel. *Includes photo-etched parts for radiator, brake discs, pedals, vertical panels for front/rear wings, and seat belts. *Slide markings for both No.11 and No.12 cars included.